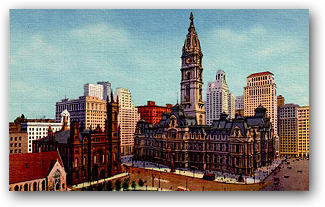 Nell Pratt is a fundraiser at a prestigious historic museum in the heart of Philadelphia. It may not be the most exciting of jobs, but Nell loves history and enjoys being around the wonderful collections. 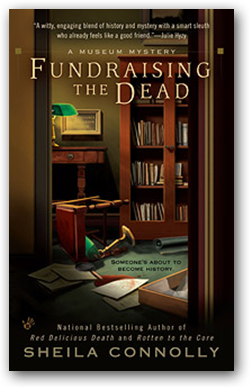 But when a body is discovered in the building after a party, she realizes that she has access to a wealth of information that can help to solve the crime, because fundraisers know everything about everybody. When she teams up with FBI Special Agent James Morrison, together they take on a surprising range of crimes inside the city's cultural community. "[The] archival milieu and the foibles of the characters are intriguing, and it's refreshing to encounter an FBI man who is human, competent, and essential to the plot." "She's smart, she's savvy, and she's sharp enough to spot what really goes on behind the scenes in museum politics." "National Treasure meets The Philadelphia Story in this clever, charming, and sophisticated caper." But soon after they arrive at the house, Cherisse is fatally shot and Tyrone is badly injured. The police believe it's just random violence in a bad neighborhood, but Nell thinks there's more to it and is determined to find answers before someone else becomes history . . .
Nell Pratt, president of the Pennsylvania Antiquarian Society, has something to smile about thanks to a generous donation from a major Philadelphia developer who's willing to help update their museum. But renovations have barely begun when a man is struck by a car in front of the building and killed. The victim is a construction worker who found a curious metal object while excavating an old privy in the museum's basement. Nell thinks the death is somehow connected to the Society, and her suspicions are confirmed when an antiques expert reveals a link between the objects from the cellar and a fellow staff member's family. 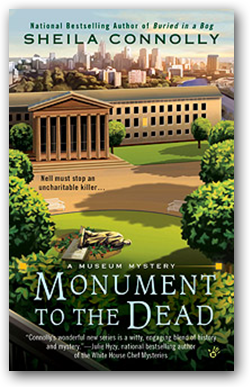 Between the challenges of her position as president of the Pennsylvania Antiquarian Society in Philadelphia and of taking her relationship with FBI Agent James Morrison to the next level, Nell Pratt has got her hands full. 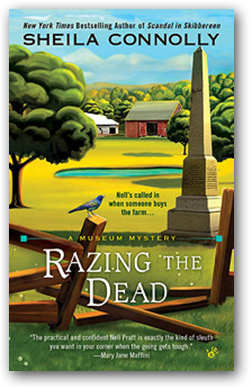 Nevertheless, when a powerful developer approaches the Society to make sure the old dairy farm he wants to level is not hiding any archeological or historical surprises that could derail the project, Nell decides to make time to personally accompany him to the proposed site. When Nell reads the obituary of a former board member, Adeline Harrison, she makes a mental note to send flowers and doesn't think twice about it—until FBI agent James Morrison shares his suspicions about the nature of Adeline's death. It turns out that a number of other members of the local cultural community have died in the last few months, under similar circumstances. 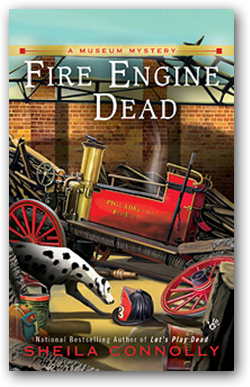 A series of warehouse fires has police scrambling for an arsonist, especially when valuable pieces in storage from the Fireman's Museum go up in flames and a guard is killed in the blaze. A picture in the paper of the museum's centerpiece—an 1825 horse-drawn hand pump—catches Nell Pratt's attention. Though charred and twisted, the vehicle is clearly not the original. Yet no one at the museum is talking. 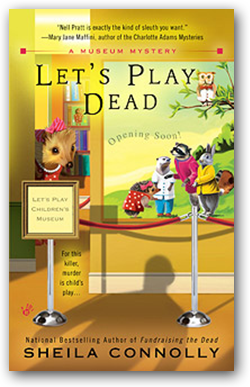 When Nell Pratt is invited to the beloved Philadelphia children's museum, Let's Play, for a sneak preview of a newly installed exhibit based on the Harriet the Hedgehog book series, she's in for quite a shock. In the middle of her visit, one of the installers gets a severe jolt from working on an electrically animated forest creature. 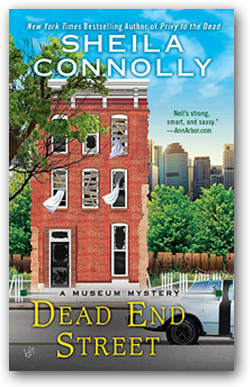 He recovers, but when a second man gets zapped—this time fatally—it sparks a homicide investigation, with Nell right in the middle of things. Is someone out to sabotage the exhibition, or to discredit the museum president, Arabella Heffernan? Even with the help of Nell's potential beau, FBI agent James Morrison, it's ultimately up to Nell to channel her energy into finding the killer—before she gets burned herself. 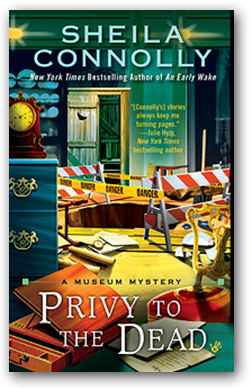 At The Society for the Preservation of Pennsylvania Antiquities, fundraiser Eleanor "Nell" Pratt solicits donations—and sometimes solves crimes. When a collection of George Washington's letters is lost on the same day that an archivist is found dead, it seems strange that the Society president isn't pushing for an investigation. Nell goes digging herself, and soon uncovers a long, rich history of crime.